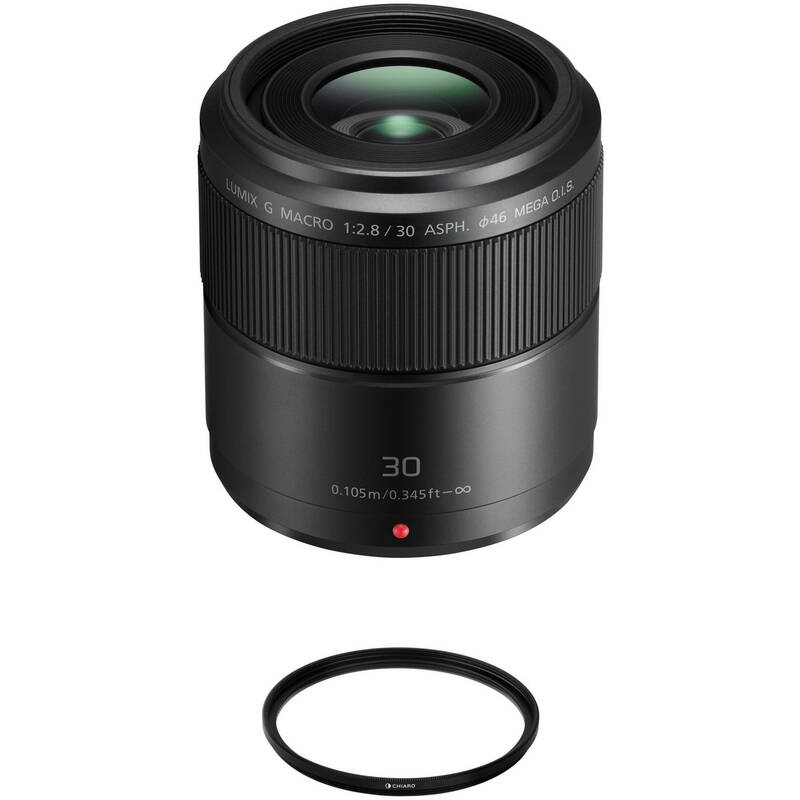 More than just the lens, the Panasonic Lumix G Macro 30mm f/2.8 ASPH. MEGA O.I.S. Lens with Circular Polarizer Filter Kit from B&H bundles the macro prime with a 46mm circular polarizer filter. The 46mm Sion Slim Circular Polarizer Filter from Vu Filters helps to reduce reflections and glare by filtering out light that has become polarized due to reflection from a non-metallic surface. The light from the sun naturally becomes partially polarized due to reflecting off electrons in air molecules, causing the light to scatter into what appears as haze. A polarizing filter arranges, and filters, this directionally polarized light perpendicularly to the reflected light, allowing for the absorption of much of this light. This results in a noticeable reduction of glare and reflections from non-metallic surfaces and an increase in the saturation of skies and foliage. Sion Slim circular polarizer filters are multi-coated, have approximately a greater than 85% average light transmission, and are constructed from Schott glass with a black rim. Set within aluminum-alloy filter rings that are durable while remaining lightweight, the glass elements provide increased clarity as well as color fidelity, while their black rims further ensure that reflections do not occur along the filter's edge. The Flat Wave Overcoat associated with this Sion Slim circular polarizer filter provides an additional layer over the multi-coatings, resulting in an improved beading effect to repel water for greater cleaning efficiency. This 46mm Sion Slim Circular Polarizer Filter's ring assembly is 3.4mm thick, to help maximize vignetting prevention. It can be rotated in order to adjust the intensity of the polarization effect, and features side knurling to provide a more textured grip for mounting or removing the filter from a lens. Flat Wave Overcoat repels water with an improved beading effect for more efficient cleaning. Greater than 85% average light transmission. Slim, 3.4mm-thick, aluminum-alloy filter ring assembly helps to maximize vignetting prevention, while remaining lightweight. Filter ring assembly can be rotated to adjust the intensity of the polarization effect. Side knurling to provide a more textured grip when mounting or removing it from a lens. Box Dimensions (LxWxH) 3.386 x 3.386 x 0.63"